"You really think you’re better than me, don’t you?" a uniformed doorman calls out after Jerry as he leaves the apartment Elaine is house-sitting in the classic Seinfeld episode "The Doorman." Soon duped into becoming the doorman himself, Jerry realizes the job -- opening the door for people, recognizing them as residents, and not intruding on their daily lives -- is a lot harder than it appears. Doormen may be the most underrated powerful people in New York. 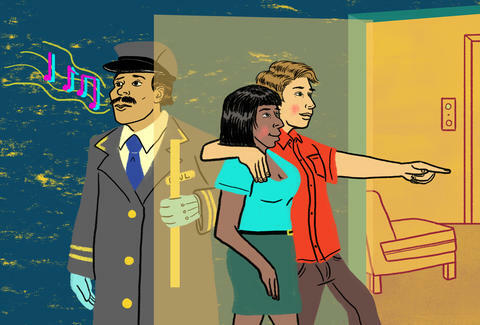 Serving as the unofficial social anthropologists of New York’s most privileged -- and often most oblivious -- doormen are filled with anecdotes of terrible human behavior. Unable to distract themselves with books or even phones (though occasionally some will sneak them in), doormen who stay up through the night have their eyes on everything and everyone at pretty much all times. Of course, most of these elite doormen are bound to strict NDAs forbidding them from publicly sharing any of the shocking behavior they witness, but we were able to track down some of the best (anonymous) stories for you to enjoy. Melissa Kravitz is a writer based in NYC. She is her own doorman.